South by Southwest (SXSW) has become one of the largest gatherings for marketers looking to reach the elusive Millennial audience, with roughly 35 thousand annual attendees. Held every March in Austin, Texas the 10-day conference features the latest innovations in film, interactive media and music. That makes it a hot spot for groundbreaking brand activations that bridge digital and live engagement worlds. 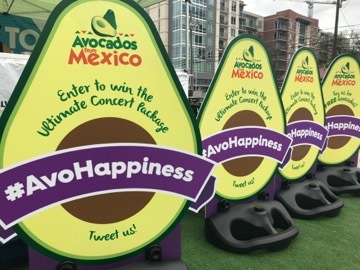 This year, IMW created the AvoHappiness Experience for Avocados From Mexico (AFM) taking over the SXSW SouthBites® Food Park to take happiness to the next level. What exactly is brand activation? In the world of Experiential Marketing, it’s bringing a brand to life through physical, digital and social environments – strategically and organically infiltrating oneself where the target audience lives and plays. SXSW offers marketers the chance to connect with consumers and gain invaluable insights in highly immersive, experiential formats. 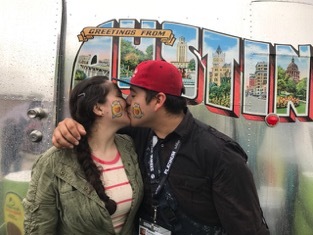 The Avocados From Mexico SXSW #AvoHappiness experience encouraged conference attendees to discover avocado happiness at SouthBites® Food Park. Visitors found much to be happy about with plenty of guac and avocado samples, a lounge area to recharge, music and prizes that encouraged visitors to share their experience online. The highlight of the experience was a one-of-a-kind, automated kitchen of the future called the Avo-Matic – a real-life shipping container turned avocado kitchen. 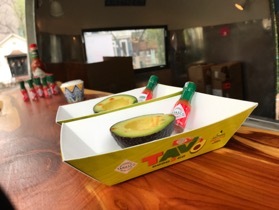 The Avo-Matic featured custom ordering software and touchscreens where attendees select their favorite ingredients to create the perfect, personalized avocado dish. While their dish was being prepared, a facial recognition game using artificial intelligence software encouraged consumers to smile in order to achieve #AvoHappiness. Guests were invited to share their experience online and enter for a chance to win one of several concert packages. The experience not only put users in the chef’s roll but also leveraged the growing self-serve, automated foodservice trend where consumers embrace food apps such as Uber Eats and Starbucks mobile ordering. This mix of Instagram-worthy avocado dishes and technology showcased how the brand embraces innovation into our brand strategy. The Avocados From Mexico brand activation went beyond the main footprint with engaging experiences throughout Austin to maximize reach. 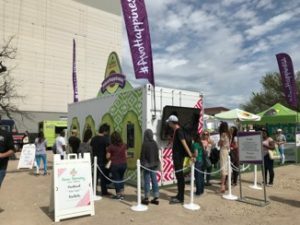 The brand partnered with over 12 of the area’s best food trucks at SouthBites® to showcase avocado infused dishes on their menus, giving guests the opportunity to engage with various cuisines while enjoying the always in season, deliciousness of avocados. Influential SXSW attendees and media attended a VIP culinary experience featuring avocados in dishes from appetizers to dessert. 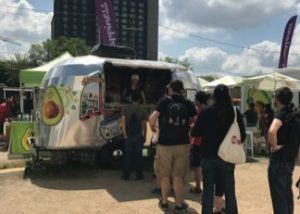 Local restaurant El Naranjo developed a week-long avocado menu and hosted an avocado bar with samples on Rainey Street – a hot spot during the conference. The multilevel engagement resulted in Avocados From Mexico becoming one of the most talked about brands at SXSW. 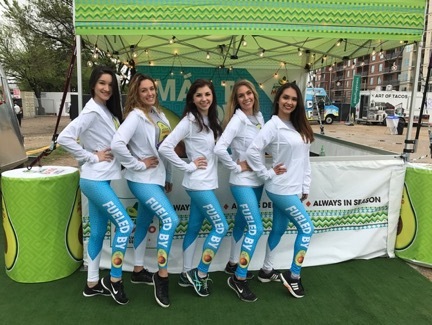 Recognized as a trailblazer in the produce category, AFM used brand activation as a way to position itself beyond guacamole and as a lifestyle brand that Millennials can embrace. The next challenge after a successful activation? Continue to build meaningful relationships with those consumers that visited the brand activation to extend the momentary wow factor and foster a lifelong brand advocate. Brand activation takeover included prominent marquee signage at the SouthBites Food Park entrance. The Avo-matic, a 20’ shipping container turned automated kitchen, delivered customized avocado dishes and a 15-minute brand experience. 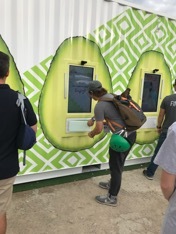 After completing a facial recognition branded game, guests received their custom avocado dish through a vending door. Custom die-cut signage throughout the SouthBites Food Park reminded festival-goers to share their experience online. 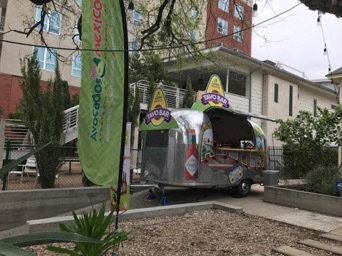 A second branded Airstream trailer featured avocados at local restaurant El Naranjo on Rainey Street, a hotspot during the conference. Product samples ranged from 10+ ingredient customized dishes to simple and unique avocado snacks. All elements in the footprint delivered the brand essence and message, including custom brand ambassador leggings!